Here is a first peek at Coolidge House in Washington, D.C., which, beginning in 2019, will serve as a base for expanded operations of the Calvin Coolidge Presidential Foundation. Known as Quality Hill, it is a historic property originally built in 1797 by John Thomson Mason, nephew of George Mason. 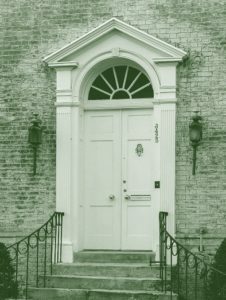 Among past owners of the property is Senator Claiborne Pell, who together with colleagues, created the “Pell Grant,” an important source of college financial aid. It is wonderfully appropriate that the Coolidge Foundation, which operates the Coolidge Scholars Program, should now enjoy the same address. There is much to learn from President Coolidge’s legacy. His emphases on civility, bipartisanship, sound budgeting, federalism, and respect for hard work and commerce are every bit as relevant today as they were in the 1920s. Unfortunately, Americans who travel through Washington, D.C. to learn about our country’s history and presidents encounter few traces of President Coolidge. Now Coolidge will have a place where travelers and scholars alike can come learn about America’s thirtieth president and find inspiration from his legacy. Coolidge House will feature an exhibit and material on President Coolidge, from his Vermont beginnings through his years in the White House. We’re sure visitors to Coolidge House will find enough inspiration to plan a subsequent trip to the President’s hometown of Plymouth Notch, where the Coolidge Foundation remains dedicated to its ongoing work. In partnership with the Vermont Division for Historic Preservation, the Coolidge Foundation will continue to welcome visitors to the President Calvin Coolidge State Historic Site. A visit to the “Notch” will remain as meaningful as ever. Current Foundation programs, including school visits, high school debate, naturalization ceremonies, and celebrations such as the Fourth of July and Old Home Day, will continue to take place in Vermont. What’s more, the Foundation looks forward to further developing new Vermont events which this year included fireworks on the Fourth of July for the first time in twenty years and the first annual Coolidge 5K in Plymouth Notch on October 6th. We hope to see you soon in Plymouth Notch or Washington, D.C. The Calvin Coolidge Presidential Foundation, based in Plymouth Notch, Vermont, is the official foundation dedicated to preserving the legacy and advancing the values of America’s thirtieth president. In the absence of an official presidential library, the Coolidge Foundation was formed in 1960 by John Coolidge, the president’s son, along with a group of fellow Coolidge enthusiasts. The Articles of Association, (last amended in 1979) call for the Foundation “to perpetuate the memory of Calvin Coolidge.” A decade ago, the board of the Foundation approved a strategic plan which called for the national expansion of the Foundation’s work. In the past several years, the Foundation has expanded programming across the country in an effort to increase Americans’ knowledge of Coolidge and the values he promoted throughout his life. The Foundation’s signature initiative is the Coolidge Scholars Program. Among the most competitive and generous undergraduate awards in America, “The Coolidge” is a full-ride, four-year, merit scholarship that can be used by recipients at any accredited college or university in the United States. Each year thousands of Americans study President Coolidge and read his Autobiography through the course of applying for the scholarship. Currently, three to four new Coolidge Scholars are selected annually after a rigorous review process that culminates with a finalist weekend in Woodstock, Vt and Plymouth Notch. The finalist jury is chaired by Gov. James H. Douglas, former governor of Vermont. In addition to the full-ride awards, the top 50 applicants each year are named “Coolidge Senators” and invited to participate in the Coolidge Foundation’s annual “Coolidge Senators Summit” in Washington, D.C. Each of these students receives a modest scholarship as well. The Foundation is building an endowment to support further program expansion. The Foundation also operates a national high school debate program. The centerpiece of the debate program is the Coolidge Cup National Debate Championship which begins with tournaments held in cities across the country — from Dallas to Raleigh to New York to Vermont. The winners of these tournaments are invited to compete for the Coolidge Cup on the Fourth of July, Coolidge’s birthday, in Plymouth Notch. In all Coolidge debate tournaments students confront pressing and relevant debate resolutions that relate to economics and public policy. Through the course of their debates, students learn about all sides of policy issues and develop critical thinking and presentation skills necessary to be successful citizens. Most importantly, the students enjoy an encounter with President Coolidge and his timeless values. To date nearly 2,000 students have participated in Coolidge Debate, hundreds of whom have come to Plymouth Notch on scholarships funded by the Foundation. In addition to the scholarship and debate programs, the Foundation organizes and hosts visits to Plymouth Notch for hundreds of school students each year and organizes conferences, symposia, lectures, and public events both in Plymouth Notch and around the country. Furthermore, the Foundation conducts original research on President Coolidge, publishes a periodical, The Coolidge Quarterly, maintains a website of Coolidge resources, and houses a modest collection of Coolidge papers and artifacts. All these efforts work together to create a community of Coolidge. We invite you to get involved and support our work to advance the ideals of Silent Cal.